Over Thankgiving weekend, a visit was paid to the hazy borderlands of West Maspeth and Blissville. 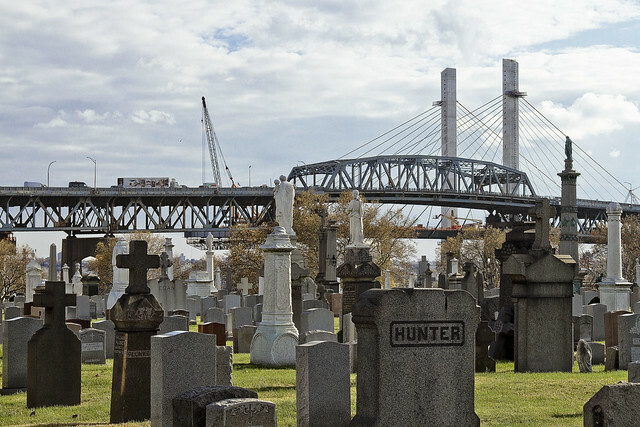 My goal was to check in on and shoot some photos on the progress the NYS DOT is making on Phase One of the Kosciuszko Bridge replacement project. 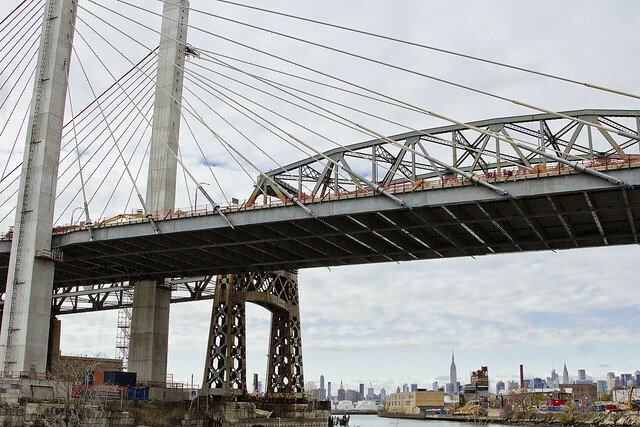 Phase One involves the creation of half of the new span, the rerouting of the Brooklyn Queens Expressway, and the demolition of the 1939 era Kosciuszko Bridge, which overflies the lugubrious Newtown Creek. 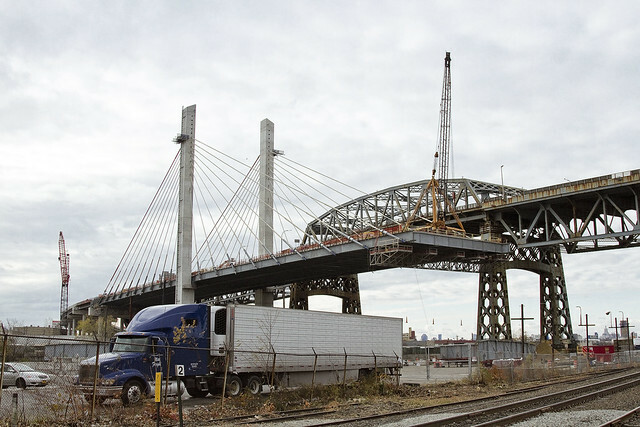 Documenting this project has been a long standing project of mine – this 2012 post tells you everything you could want to know about Robert Moses, Fiorella LaGuardia, and the origins of the 1939 model Kosciuszko Bridge. Just before construction started, I swept through both the Brooklyn and Queens sides of Newtown Creek in the area I call “DUKBO” – Down Under the Kosciuszko Bridge Onramp. Here’s a 2014 post, and another, showing what things used to look like on the Brooklyn side, and one dating back to 2010, and from 2012 discussing the Queens side – this. Construction started, and this 2014 post offers a look at things. 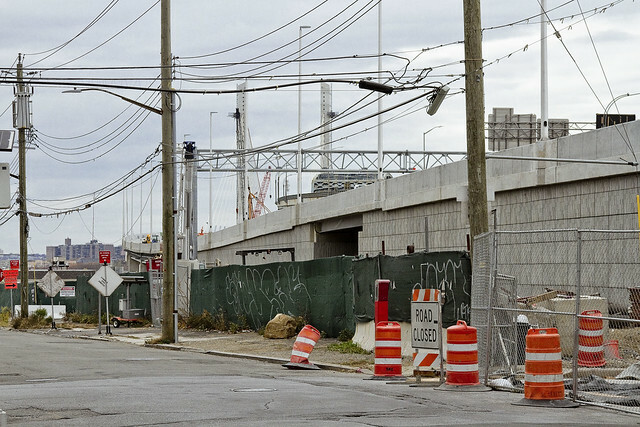 There’s shots from the water of Newtown Creek, in this June 2015 post, and in this September 2015 post, which shows the bridge support towers rising. Additionally, this post from March of 2016 detailed the action on the Queens side. Most recently, here’s one from May of 2016, and one from June of the same year. Finally, here’s one from August of 2016. The roadway now extends out over the water and is firmly shadowing the concrete devastations of Queens, nearly crossing the LIRR Lower Montauk tracks. The BQE Onramp also seems to be coming along, and I suspect that the DOT’s contractors will be joining the bridge span to the Queens side approaches pretty soon. Speaking of the BQE Onramp, there it is. 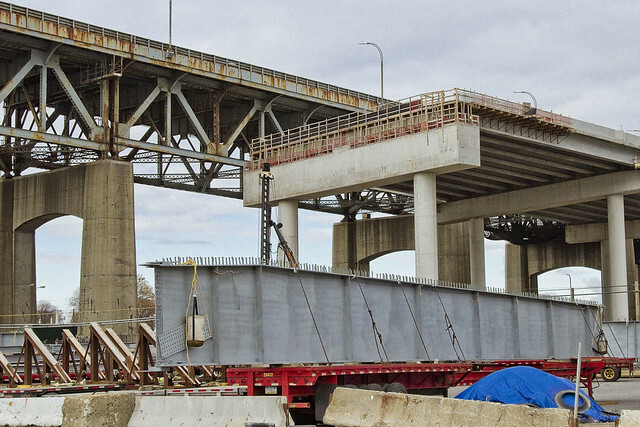 In the foreground is one of the structural steel sections which will be joined to the span and support the road surface. Not pictured are the “panels” of the road surface, which arrived a couple of days later and which were noticed during a subsequent and unrelated visit to the area. In the shot above, you can see how the sections are attached. This is a cable stay bridge, of course. 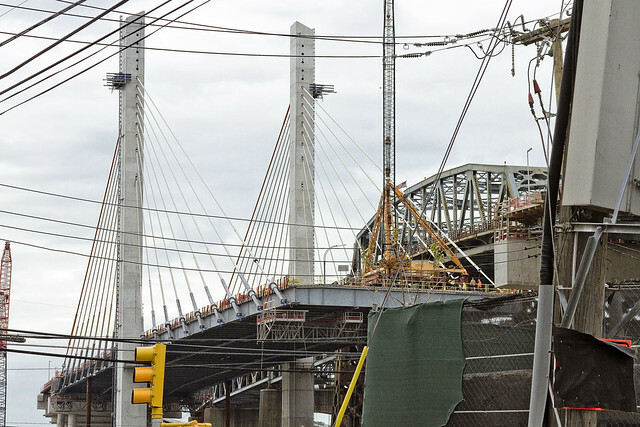 The roadway above will carry four lanes of two way traffic, but it’s just half of the new bridge. 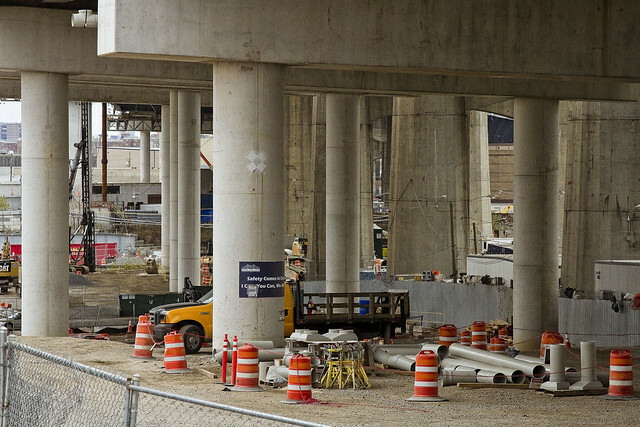 When the western half of the project is complete, there will be four lanes in each direction, and there’s also going to be a bicycle and pedestrian path. That’s awesome. Cannot wait to shoot from up there. 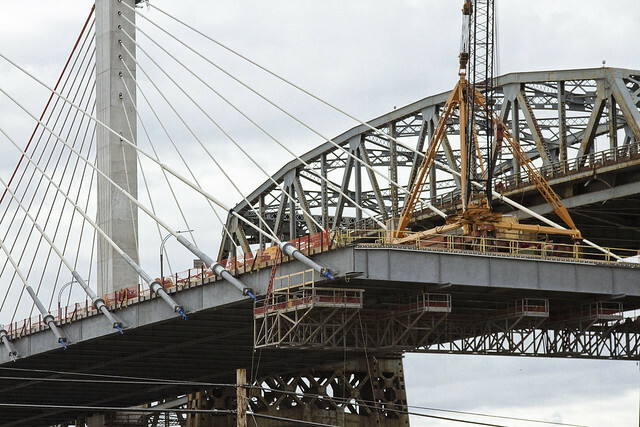 The new bridge, as I’ve been mentioning for several years at this point, is going to be quite a bit lower than the 1939 model. That’s going to bring noise issues to Maspeth and Blissville, I fear, but let’s see what DOT has planned. The NYS DOT is currently wondering what to do with the areas on both sides of the Creek which these columns rise from. There’s talk of public space and treating the two spots in the manner of a park or playground. Further back in Queens, to the north actually, the approaches to the new bridge seem to be ready for business. I haven’t managed to get up there yet, but cross your fingers, maybe I can talk the DOT folks into a walk through soon. Given the fantastic sort of luck for which I’m distinguished, just as I started back for home (cutting through Calvary Cemetery) the misty murk occluding the burning thermonuclear eye of God itself began to break up, allowing the sky to turn blue and light to suffuse. I turned around and grabbed one last shot, while cursing. Thanks for these images. Speaking as a former Greenpoint resident the K. can’t go away too quickly. I don’t know what the original funding was, but it’s always struck me as one of those cheapjack Moses projects.